Did someone say Nostalgia Drag Racing? This looks to have all the markings of a really great event. According to Wayne Skinner, the gentleman putting this event together, it will take place at Steel Valley Dragway, Smithfield, Ohio on June 25&26 of this year. 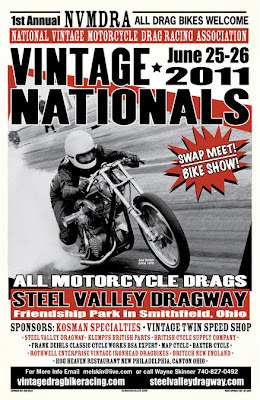 Put these dates on your calender if you are a fan of vintage motorcycle drags. Put them in big letters and red ink if you have a vintage drag bike! The 1/8 mile drag strip is located on an old 4000 foot long airstrip. You know what that means. Plenty of shut down area for those of us running bikes with somewhat less than modern brakes ... always a good thing (the extra shut down - not the antique brakes). The purpose of this event is to promote vintage drag racing, with vintage being defined as 1972 or earlier. All makes are welcome, in fact encouraged. That is one of the really cool aspects of this event; it will be a true return to what motorcycle drag racing was like in its infancy. Wayne himself is in the process of building a replica of the Triumph drag bike he campaigned in the early '70s. Yeah, guess you could say that we are both on the same page! For this inaugural event, all years of motorcycles are invited to compete; street, gas and fuel, though the main focus will be on the vintage iron. That means that even if you are still working on your vintage drag bike, you really should come out and run your street bike just to be a part of the action. If your street bike is a Knuckle, Pan, Shovel, Iron Sportster or for that matter a '72 or earlier Jap or Brit, then it already fits the criteria to be one of the stars. After all, street ridden bikes have been a part of the drag racing scene since the very beginning! Wayne is pretty serious about making the National Vintage Motorcycle Racing Association work. He has been actively pursuing vendors willing to provide some of the hard to come by pieces to make vintage drag racing a reality. He has several frame builders making reproductions of some of the famous drag frames of yesteryear, including Yetman style, Hagon, and of course the Truett & Osborn tanker style. He is also working with a tire company to reproduce an 18x4 slick such as those so popular on drag bikes of the past. And it doesn't stop there. Billet Triumph cases as well as jackshafts for hi gear bikes are also in the works. Of course all this is really cool, and fun to daydream about, but in order for it to become a reality and not just a one shot event, you need to show up. Nothing puts a damper on an event like this more than a dismal turn out. In the late 1970s I found myself, a scumbag biker working a job I hated, with unused GI Bill benefits that were soon to expire. I had always been pretty much of a gear head, and once I heard about a vocational school program for motorcycle mechanics here in Minnesota, my future was pretty much sealed. Once I graduated the two year program, the search was on for a job as a Harley mechanic, and let me tell you, the jobs were few and far between back then. After exhausting all the possibilities here in my home state, my soon-to-be wife and I took off cross country to visit her parents in the oil fields of New Mexico, with the objective of applying at every Harley dealership along the way. Of course before we left there was one thing which had become painfully obvious that I had to do in order for there to be a chance that it would be a successful trip; get a haircut! It seems that at that time the Motor Company was still fighting off the bad boy biker image that it so lovingly embraces all the way to the bank today. So it was adios to the five year growth of hair that I had accumulated since leaving Uncle Sam's service. An additional tight trim of the old beard made me look down right employable. And it worked! We only had to get as far as Pueblo Colorado before I received a job offer. After a couple years in the dealership there, I found that there was not much problem getting hired at another. That old thing about having dealership experience on your resume was, of course, true. So after about eight years working in dealerships, and another eight or so in independent shops, I finally went on my own. In all that time, I have seen a lot of shops come and go. Most of the Harley dealerships managed to hang on through the tough times. Many of the independent shops did not. A number of years ago, due to a convergence of circumstances, the Harley aftermarket really took off. It may have had a lot to do with the whole Orange County "American Chopper" phenomenon, or that may have been merely a symptom, but suddenly it seemed that everyone who had ever thrown his leg over a motorcycle was opening a chopper shop. Those were gravy days for most of those shops. They would appear one day out of the blue (as far as I could see) with fancy names, fancy (expensive) storefronts, and fancy bikes with fancy price tags. I always assumed that most of these shop owners had made their fortune in other lines of work, but could not resist the lure of how unbelievably cool it would be to mimic one of the Teutuls. Sort of like the classic mid life crisis, only with bike shops instead of Corvettes. It didn't seem to much matter that many of these choppers started to literally fall apart after a few dozen trips to the local watering hole. It was painfully obvious to anyone paying attention that many of these shops had little regard for their reputation. Along about that time, most shops made it their policy not to work on anything older than an Evolution. Most dealerships wouldn't even work on them. I am proud to say that I never joined in on that fad. Oh, I admit I tried to talk a good number of potential customers out of rebuilding their Iron Head Sportsters, but my motivation was to keep them from spending more money on their engines than their whole bike was worth. The final word from me was always "if you plan on keeping the bike forever, and it doesn't matter to you that you are spending more on the motor than the resale value of the bike, then yes I will rebuild it." Now with the economy back down in the dumps, most of those high dollar chopper shops are a thing of the past, so it hardly matters whether or not they built a quality product and stood behind their work or not. So, why did I spend time working on older motors when there was plenty of low hanging fruit that would have been much more profitable? Well, I guess the reason was the same one that has led me to jealously protect my professional reputation over the years: because I was in it for the long haul. Whether by instinct or conscious decision, I knew that eventually those old Harleys would be desirable again, and I am beginning to see it happen. The young guns who bring in old Shovel or Iron Head parts today no longer have a fit when you give them a labor quote. In fact they seem genuinely pleased to deal with someone with experience on the old motors. I owe that in part to being in it for the long haul. But the whole idea of "being in it for the long haul" also applies to another area of my life, and your life too, if you are a Christian. Phillipians 1:6 tells us "Being confident of this very thing, that he which hath begun a good work in you will perform it until the day of Jesus Christ" You see, this is why I am in it for the long haul as touches Christianity. It comes with the territory. It is God, not I, which started this work of salvation in me back in the spring of 1999, and the Bible assures me that he will continue working on me until either I depart to be with him in spirit, or he returns to be with us in the flesh. Either way, it is a blessing that, as Christians, we are not left to our own devices to "maintain" our salvation, because as Paul said in Romans 7:18, "For I know that in me (that is, in my flesh,) dwelleth no good thing: for to will is present with me; but how to perform that which is good I find not." But praise the Lord, we do not have to depend on our own weak flesh; we are able to depend on him. 2 Tim. 4:18 tells us, "And the Lord shall deliver me from every evil work, and will preserve me unto his heavenly kingdom: to whom be glory for ever and ever. Amen." Of course there are two sides to every coin. And the flip side to God's deliverance from hell is NOT to live as you like because you are heaven bound. As the apostle Paul would say "God Forbid!" The Lord leads us down a narrow path between the ditch of the fear of tripping up and losing our salvation on the one side, and sinning willfully on the other. That path on which he guides us so carefully has this marker on it from Phillipians 2:13" For it is God which worketh in you both to will and to do of his good pleasure." Roughly paraphrased, that means that God will make his children to do what he wants them to, but he accomplishes it not through fear, but by changing them in such a way that they want to please him. And that means that if you really are a Christian, you are in it for the long haul! We recently lost one of the true legends of the motor sports industry. On Wednesday, April 6th, Joe Mondello succumbed to complications from surgery. He was 74 years old. If you set out to name someone who had a bigger influence on the entire spectrum of racing and high performance, you would have a tough time coming up with anyone to rival Joe Mondello, and yet for the most part the level of name recognition does not match his achievements. Throw out the name Joe Mondello in front of a group of ten racing enthusiasts and my guess is that one person would know about Joe, and maybe one more would say the name is familiar. Ah, but start tossing out the name of racers the Joe ported heads for over the years, and each and every one of the group would recognize multiple names. Just a few of the more well known names in motor sports who have used Joe's porting include A.J. Foyt, Andy Granatelli, Walt Austin, Mickey Thompson, Ak Miller, Carrol Shelby, Tony Nancy, Chris Karamesines, Roland Leong, Shirley Muldowny, Don Garlits, Stone Woods & Cook, Connie Kalleta, Don Prudhomme, Ed Pink, Grumpy Jenkins, Tommy Ivo, John Force, Eddie Hill, Hollman & Moody, Gary Ormsby, Jungle Jim Liberman, Smokey Yunick, Tom McEwen, Junior Johnson, Keith Black, John Mazmanian, Joe Hunt, ....and the list goes on and on. Not only did Joe Mondello port heads for winning racers, he ported record setting heads for them. The first 7, 6, and 5-second Top Fuel runs and the first 200 mph runs in Top Gas, Top Fuel, Injected Fuel and Fuel Altered were all accomplished using Mondello cylinder heads. When I first met Joe Mondello, it was via a lecture that he was giving at a Performance and Racing Industry trade show years ago. At the time he was promoting his cylinder head porting school. I looked into attending, but just wasn't sure I should spend the time and money, because after all, he was a car guy and I port Harley heads. Boy did I miss the boat there. More years passed and I heard him speak at another trade show. By then it seemed that Joe was doing a lot more with Harley heads; a little late to the game, I thought, but this time I decided that I really needed to take the time to attend his school. So, in November of 2007 I made the trip to Joe's new facility in Tennessee for a 3 day, one on one, advanced cylinder head porting course. They say you can't teach an old dog new tricks, but despite having ported over 750 sets of Harley heads before studying under Joe, I came away with better cylinder head porting skills. I also finally came to the realization that Joe was not just a "car guy." Not only have major automobile OEMs like Ford sent their people through Joe's porting school, so have Harley Davidson and S&S. But here is another not so well known fact, Joe Mondello was porting Harley heads since way back when. And when Joe Mondello ported a head, it was likely to be a winner. His Harley head porting was no different. Another legendary racer to add to the above list of winners using Mondello heads is Joe Smith. Granddaddy Joe Smith was the Harley racer who accomplished most of the "firsts" in motorcycle drag racing throughout the '60s and ''70s. First 8 second motorcycle, first 7 second Harley Davidson, first 180mph motorcycle: and of course Joe Mondello's porting expertise played its part in all of that history. One of the things that sticks out in my mind is that, as he stood by my side in the porting room at the Mondello Tech Center teaching me the fine points of proper shaping , Joe told me that even after 50 years of it, he still loved to port heads! That is a testimony as to how blessed we are when we are able to make a living doing the work we enjoy. Of course now Joe Mondello's legacy will continue on because of his foresight in opening a school to teach his techniques. Each of Joe's former students will in effect, extend that legacy. There can be no doubt that the motor sports industry has lost one of the great ones with the passing of Joe Mondello. My condolences go out to his wife Mary, the rest of Joe's family, and the crew down at Mondello Technical Center. Joe will be sorely missed. Many of us recall the story of Zacchaeus. When he heard that Jesus was going to pass through town, Zacchaeus wanted to see him. But he had a couple of problems. The first was that there was a whole crowd of people who also wanted to see Jesus, and the second was that he was short. He couldn't see over the crowd. But he didn't let those things stop him; he climbed up into a tree so that he would be able to see the one who it seemed that everyone was talking about. These few short verses give us the story of Zacchaeus from the Bible. Luke 19:1-10 And Jesus entered and passed through Jericho. And, behold, there was a man named Zacchaeus, which was the chief among the publicans, and he was rich. And he sought to see Jesus who he was; and could not for the press, because he was little of stature. And he ran before, and climbed up into a sycomore tree to see him: for he was to pass that way. And when Jesus came to the place, he looked up, and saw him, and said unto him, Zacchaeus, make haste, and come down; for to day I must abide at thy house. And he made haste, and came down, and received him joyfully. And when they saw it, they all murmured, saying, That he was gone to be guest with a man that is a sinner. And Zacchaeus stood, and said unto the Lord: Behold, Lord, the half of my goods I give to the poor; and if I have taken any thing from any man by false accusation, I restore him fourfold. And Jesus said unto him, This day is salvation come to this house, forsomuch as he also is a son of Abraham.For the Son of man is come to seek and to save that which was lost. I would like to point out a few things from this story, and then draw some parallels. These verses tell us that Zacchaeus was a rich man. Just one chapter back in the Bible Jesus had been asked by a rich man how to inherit eternal life. Jesus, to test him, told him to keep the commandments, ...but the man claimed that he had always kept them. Then Jesus told him to sell his possessions, and this was too much for the man, so he went away sorrowful. At this point Jesus stated, "For it is easier for a camel to go through a needle's eye, than for a rich man to enter into the kingdom of God." And yet, here Jesus tells us that salvation had come to Zacchaeus! You may be wondering how that is possible, and you'd be in good company. Jesus own disciples wondered the same thing when he first made the statement about a rich man entering into the kingdom of God. They asked Jesus, "Who then can be saved?" The answer which Jesus gave to that question is borne out in the story of Zacchaeus. He said, "The things which are impossible with men are possible with God." This story also points out that Zacchaeus was a sinner. In fact, it was so well known to the townspeople that Zacchaeus was a sinner, that they were aghast that Jesus would actually be a guest in his house. It is pretty obvious that Zacchaeus himself understood that he was a sinner, because his reaction to this encounter with Jesus was to offer restitution for his wrongdoing. Compare that with the rich man from the previous chapter who seemed to believe that he had never broken God's commandments! The last thing I would like to point out is that Zacchaeus repented. Repentance means to change your direction. Evidently Zacchaeus had previously hoarded his riches, because now he said he would give half his money to the poor. Obviously he had also gotten some of his riches by false accusation, probably in his role as a tax collector. Now he wanted to repay that ill gotten gain, and not only repay it, but repay it fourfold! But the rich man from the previous chapter? He had nothing to repent of because he didn't see himself as a sinner. So, we have the stories of two rich men who each had an encounter with Jesus. The one, Zacchaeus, is in heaven today with his Lord and Savior Jesus Christ. The other, so far as we know, never saw the kingdom of God, but only inherited eternal death. There are at least three key things we can take away from this story to be true of Zacchaeus. Consider with me now whether these things are true of you. Zacchaeus understood that he was a sinner; have you ever considered your sinfulness? Zacchaeus met Jesus Christ, and as this passage tells us he "received him joyfully." Can you say the same? Zacchaeus repented of his sins. If these things, which are true of Zacchaeus, are not true of you, then it is not too late. It is possible that this day salvation could come to your house. As the Bible says in 2 Corinthians 6:2 "now is the day of salvation"